A black hole has no hair. In Geons, Black Holes, and Quantum Foam (2000), 297. Quote introduced previously as the No-Hair Theorem in Charles W. Misner, Kip S. Thorne and John Wheeler, Gravitation (1973). A DNA sequence for the genome of bacteriophage ΦX174 of approximately 5,375 nucleotides has been determined using the rapid and simple “plus and minus” method. The sequence identifies many of the features responsible for the production of the proteins of the nine known genes of the organism, including initiation and termination sites for the proteins and RNAs. Two pairs of genes are coded by the same region of DNA using different reading frames. Frederick Sanger, et al., 'Nucleotide Sequence of Bacteriophage ΦX174 DNA', Nature (1977), 265, 687. Dibdin said: 'I see you've put your own name at the top of your paper, Mr Woods.' His eyes looked sad and thoughtful. 'I always make it a matter of principle to put my name as well on every paper that comes out of the department.' 'Yours?' Albert said incredulously. 'Yes,' said Dibdin, still sad and thoughtful. 'I make it a matter of principle, Mr Woods. And I like my name to come first—it makes it easier for purposes of identification.' He rounded it off. 'First come, first served'. The Struggles of Albert Woods (1952), 53. Genes make enzymes, and enzymes control the rates of chemical processes. Genes do not make ‘novelty seeking’ or any other complex and overt behavior. Predisposition via a long chain of complex chemical reactions, mediated through a more complex series of life’s circumstances, does not equal identification or even causation. I try to identify myself with the atoms ... I ask what I would do If I were a carbon atom or a sodium atom. Comment made to George Gray (Rockefeller's resident science writer and publicist). Quoted In Thomas Hager, Force of Nature: The Life of Linus Pauling (1995), 377. In The Relevance of British Socialism (1964), 41. See also Sir Alan Cottrell, Physics Bulletin (Mar 1976), 102. My main thesis will be that in the study of the intermediate processes of metabolism we have to deal not with complex substances which elude ordinary chemical methods, but with the simple substances undergoing comprehensible reactions... I intend also to emphasise the fact that it is not alone with the separation and identification of products from the animal that our present studies deal; but with their reactions in the body; with the dynamic side of biochemical phenomena. 'The Dynamic Side of Biochemistry', Address (11 Sep 1913) in Report on the 83rd Meeting of the British Association for the Advancement of Science (1914), 653. Picture yourself during the early 1920's inside the dome of the [Mount Wilson Observatory]. … [Milton] Humason is showing [Harlow] Shapley stars he had found in the Andromeda Nebula that appeared and disappeared on photographs of that object. The famous astronomer very patiently explains that these objects could not be stars because the Nebula was a nearby gaseous cloud within our own Milky Way system. Shapley takes his handkerchief from his pocket and wipes the identifying marks off the back of the photographic plate. Of course, Hubble came along in 1924 and showed that it was just these Cepheid variable stars in the Andromeda Nebula which proved it was a separate galaxy system. Pierre Curie, a brilliant scientist, happened to marry a still more brilliant one—Marie, the famous Madame Curie—and is the only great scientist in history who is consistently identified as the husband of someone else. View from a Height (1963), 119. 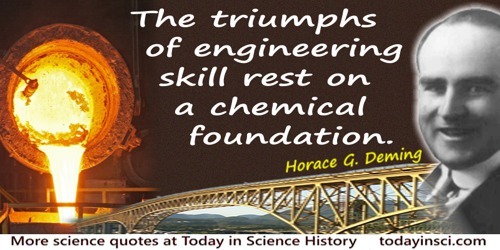 Science aims at constructing a world which shall be symbolic of the world of commonplace experience. It is not at all necessary that every individual symbol that is used should represent something in common experience or even something explicable in terms of common experience. The man in the street is always making this demand for concrete explanation of the things referred to in science; but of necessity he must be disappointed. It is like our experience in learning to read. That which is written in a book is symbolic of a story in real life. The whole intention of the book is that ultimately a reader will identify some symbol, say BREAD, with one of the conceptions of familiar life. But it is mischievous to attempt such identifications prematurely, before the letters are strung into words and the words into sentences. The symbol A is not the counterpart of anything in familiar life. From 'Introduction', The Nature of the Physical World (1928), xiii. The fundamental biological variant is DNA. That is why Mendel's definition of the gene as the unvarying bearer of hereditary traits, its chemical identification by Avery (confirmed by Hershey), and the elucidation by Watson and Crick of the structural basis of its replicative invariance, are without any doubt the most important discoveries ever made in biology. To this must be added the theory of natural selection, whose certainty and full significance were established only by those later theories. In Jacques Monod and Austryn Wainhouse (trans. ), Chance and Necessity: An Essay on the Natural Philosophy of Modern Biology (1971), 104. The Historic Method may be described as the comparison of the forms of an idea, or a usage, or a belief, at any given time, with the earlier forms from which they were evolved, or the later forms into which they were developed and the establishment from such a comparison, of an ascending and descending order among the facts. It consists in the explanation of existing parts in the frame of society by connecting them with corresponding parts in some earlier frame; in the identification of present forms in the past, and past forms in the present. Its main process is the detection of corresponding customs, opinions, laws, beliefs, among different communities, and a grouping of them into general classes with reference to some one common feature. It is a certain way of seeking answers to various questions of origin, resting on the same general doctrine of evolution, applied to moral and social forms, as that which is being applied with so much ingenuity to the series of organic matter. The unprecedented identification of the spectrum of an apparently stellar object in terms of a large red-shift suggests either of the two following explanations. The stellar object is a star with a large gravitational red-shift. Its radius would then be of the order of 10km. Preliminary considerations show that it would be extremely difficult, if not impossible, to account for the occurrence of permitted lines and a forbidden line with the same red-shift, and with widths of only 1 or 2 per cent of the wavelength. The stellar object is the nuclear region of a galaxy with a cosmological red-shift of 0.158, corresponding to an apparent velocity of 47,400 km/sec. The distance would be around 500 megaparsecs, and the diameter of the nuclear region would have to be less than 1 kiloparsec. This nuclear region would be about 100 times brighter optically than the luminous galaxies which have been identified with radio sources thus far. If the optical jet and component A of the radio source are associated with the galaxy, they would be at a distance of 50 kiloparsecs implying a time-scale in excess of 105 years. The total energy radiated in the optical range at constant luminosity would be of the order of 1059 ergs. Only the detection of irrefutable proper motion or parallax would definitively establish 3C 273 as an object within our Galaxy. At the present time, however, the explanation in terms of an extragalactic origin seems more direct and less objectionable. '3C 273: A Star-like Object with Large Red-Shift', Nature (1963), 197, 1040.